A complete revue of eleven entertainers that includes five female Polynesian dancers, two male dancers/fire knife dancers, and a four piece band. This full cast of performers creates an exciting, comical, and interactive evening (both male and female guests are brought on stage and taught to hula) of music, dance and fun in the South Pacific. 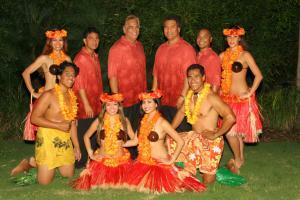 Show includes lei greeting, dinner music, and 50-60 minute show to cover up to a three hour time frame.